According to a study in Pediatrics Magazine, the fact that many public schools open in August leads to environmental stresses on students and teachers due to seasonal temperatures. The risk of heat illness such as heat stress is especially high for children. The American Academy of Pediatrics explains that this is because their bodies are less able to adapt to increases in temperature. Children are also less aware of the need to take preventative action to avoid heat stress. Under normal conditions, temperature and humidity are the biggest factors in comfort for students and teachers. The American Society of Heating, Refrigeration, and Air Conditioning Engineers (ASHRAE) created an index for determining heat stress, which is based on human physiology, clothing and standard room conditions called the “Effective Temperature” (ET). The ET is a measure of temperature that includes humidity and degrees Fahrenheit and serves as a single coordinate to identify comfort zones. During clinical trials, researchers in ASHRAE found that as the ET increased from 79* ET to 97* ET, children made 90 errors per hour, rather than the initial average of 12. 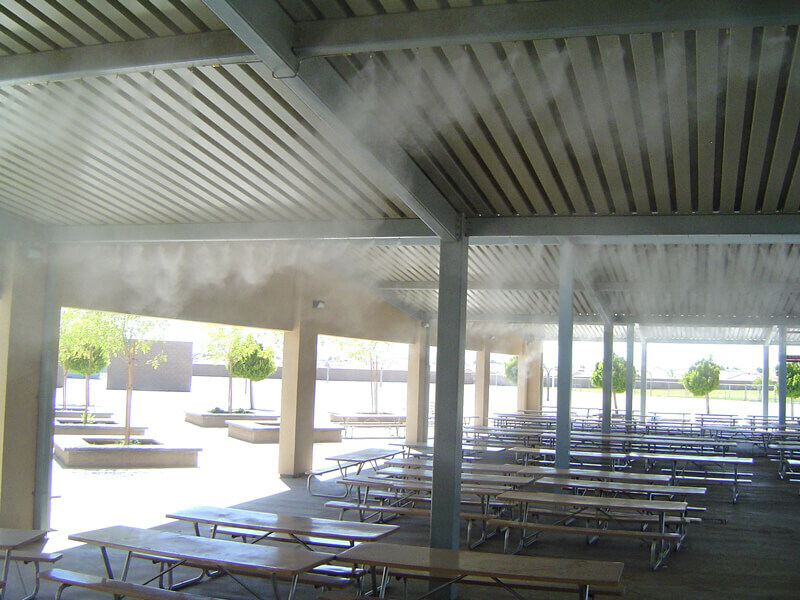 ASHRAE recommends that all school environments be kept at 70* ET for improved performance and health. An ET of 80* is the highest recommended for children for extended periods of time. Anything above that can lead to heat cramps, stroke or exhaustion. The ASHRAE study proved that heat inside the classroom has a negative effect, but when coupled with the exertion of physical play during recess or lunch, the effects are compounded. Another study in Pediatrics Sports Medicine focusing on outdoor exercise and play found that children have an adverse reaction to climates that reach temperatures above 80 degrees Fahrenheit. During warm months, heat stress is a much higher risk, especially in areas like the South or Southwest where it is not uncommon for temperatures to exceed 100 degrees. When students are spending August, September, May and June in school, they are at the mercy of the elements. Degraded learning performance is one adverse effect, but exposure to heat can also pose significant health risks from dehydration and heat exhaustion to heat stroke or even death. Indoor areas at schools and daycares may be equipped with air conditioning, but heat presents a challenge to outdoor play areas and lunch areas that are often not equipped to handle rising temperatures. Many schools utilize outdoor areas for lunch breaks and/or recess play and these activities often take place during the hottest parts of the day – between 11 am and 3 pm – so heat is a factor. Climate must be factored into the equation to limit risk and ensure safety and the responsibility rests with school administrators, planners and architects alike.